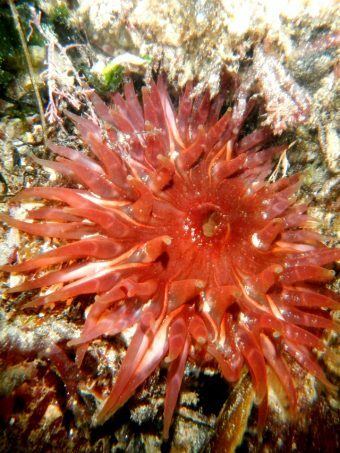 Helford Voluntary Marine Conservation Area » Shore search reveals stunning marine wildlife around the Cornish coast! Shore search reveals stunning marine wildlife around the Cornish coast! Volunteers from Cornwall Wildlife Trust were recently treated to some incredible finds during a county-wide survey of life on some of our most important rocky shores. The ‘shore search’ survey was carried out at St Agnes, Polzeath, Looe, Fowey and Helford over four days, which saw some of the lowest spring tides of the year. The survey uses a new method that allows data to be inputted into a national marine recorders database. Each year it will be repeated and the information gathered will provide a really useful tool for monitoring the health of our shores. The Trust’s Matt Slater and Lisa Rennocks carried out this important work with the help of dedicated volunteers from all five of Cornwall’s Voluntary Marine Conservation Areas (VMCAs). The volunteers were fortunate to have been joined by marine experts from the Porcupine Marine Natural History Society who were in Cornwall on a field trip. Help was also provided by staff from Natural England and by marine biology staff from Cornwall College, Newquay. Their expertise added to the survey’s success and an incredible diversity of marine life was catalogued. During the survey at Trevaunance cove, St Agnes, two specimens of a tiny spiny crab known as ‘toothed crab’ were found and at both St Agnes and Polzeath. Also discovered was a very rarely recorded bizarre trumpet-like stalked jellyfish (Trust). Continuing the survey at Fowey and the Helford, a startling diversity of species were found including many species of delicate red seaweeds with exotic names such as beautiful eyelash weed, bunnies ears, and winged weed. 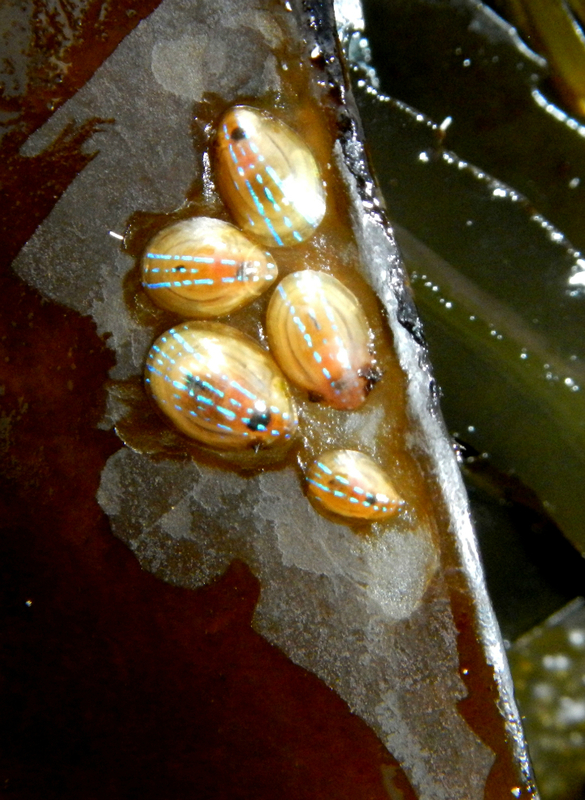 At Prisk cove, part of the Helford Voluntary Marine Conservation Area, the team found a tiny sea slug called Berthella plumata and gaudily marked shrimps. While on the shore at Readymoney Cove, Fowey, highlights included tiny seahorse-like worm pipefish, giant volcano barnacles and a tiny, rarely seen sea cucumber. An important part of the survey work was to look for invasive species that are not native to Cornish shores but that have become established over the last few decades. The Your Shore Project has been set up by Cornwall Wildlife Trust to work with Voluntary Marine conservation Areas (VMCAs) in Cornwall, to allow access to its rich and diverse marine environment. The project is being funded by Heritage Lottery Fund (HLF) with a grant of £103,000 with match funding from South West Water. The aim is for the volunteer conservation groups to either strengthened or re-established in each of the target areas. Their task will be to focus on Cornwall’s diverse natural marine heritage, which is recognised as being of both regional and international importance. It contributes to the county’s appeal as a tourist destination, attracting more than five million visitors each year, but also requires protection for the same reason. All five of the VMCAs have independent marine conservation groups working hard to protect and educate people about their valuable marine life. If you are interested in more information about your local VMCA, please visit www.cornwallwildlifetrust.org.uk/yourshore or contact Matt Slater on matt.slater@cornwallwildlifetrust.org.uk or (01872) 273939 ext 214.